On The Marriage of Two Friends – Sanspoint. In August of 2008, I introduced a good friend of mine from my college days to a good friend of mine from my high school days. The original plan was to meet up at Eulogy Belgian Tavern, and I would introduce one to the other in person, but they went behind my back and had a first date on their own. Rob and Rebecca seemed to hit it off quite well, and before long, they’d moved in together, and talked in an idle way about possibly getting married one of these days. Then, this past April, I got a text from Rebecca dropping big news: the talk was becoming reality, spurred on by the impending arrival of their first child. I was to be Best Man. On September 4th, the big day happened. In a catering hall in Langhorne, PA, at about 1:00 PM, Rob Asheuer and Rebecca Friedenberg got legally married in an interfaith ceremony, in front of 100 family and friends. It’s a remarkable thing watching two people who you know so well get married. It’s even more remarkable when you know that it was you that put the whole thing in motion. Though the day was all about Rob and Becca, their friends, family, and the bridge and groom themselves repeatedly laid down thank-yous and “I’ve heard good things about you”s all afternoon. Standing at the side of the stage, with Rob’s little brothers as groomsmen, handing over the ring, hearing two people who know so well, publicly profess their love for each other, well, it brings a tear to one’s eye. It should be the start of a wonderful life for the both of them. You know, time goes by fast. When I set these two up, what was it, a couple months ago? When I set these two up, I didn’t expect it to go this far, or this fast. Well, mostly I didn’t expect it to go this fast. Okay, obviously, it was longer than that, but it feels like it was pretty recently. But, now, here we are, basking in the union of two people who totally deserve each other—and you can take that statement in whatever way you want to. After all, I remember when I told my parents that I was setting Rob and Becca up. Their first remark was, “Well, we know who’s going to be wearing the pants in that relationship.” I think that prediction was borne out, am I right? So, now, they’re starting that journey of “mawwige,” and hopefully they’ll stick with it for a while. Otherwise, there goies my potential career as a matchmaker down the tubes, so I hope you two keep that in mind before anyone goes calling an attorney somewhere down the line. I have a reputation to uphold now. To get back to these two, I would like to paraphrase the great Douglas Adams: “They may not have gone where they intended to go, but I think they have ended up where they needed to be.” From what I know of Rob, and what I know of Becca, before they got together—well, we’d be here until tomorrow morning, and I don’t think they’d get the deposit back—this relationship’s brought out the best in both of ‘em. Rob, Becca, you two are going to be great together. I know it. Now, don’t prove me wrong. 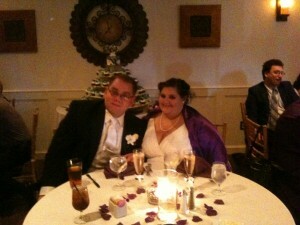 Congratulations, Mr. and Mrs. Asheuer. All the best to you.